Berlin – Threats and insults have been voiced in the past against Uri Feinberg (37), a restaurant owner in Freiberg, because of his Jewish background. An event that took place in December 2017 was published all over the world when a man of German origin shouted at him for many minutes in front of the restaurant. But the situation continues to worsen. A man named Lutz P. From Leipzig writes almost every day. He denies the Holocaust and threatens to hurt him. 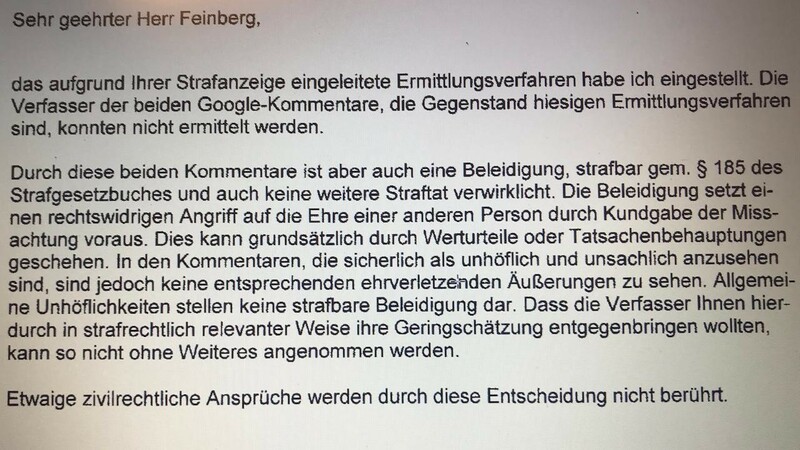 In another case, a Berliner of Turkish origin, Regip Y., told Feinberg in April 2018: “Hitler’s times will return and we’ll all put you in the oven, you bastards!” Feinberg sent a video of the phone call to the police. The caller even sent his number, probably by mistake. The police could have determined his identity. Lutz of course is not mentally ill, but nothing happened. Feinberg received in October 2018 a letter from the prosecutor Office stating that the case was closed because he did not file a criminal complaint. And that’s not true. The chef is grateful that the local police tries to protect him as much as possible. The police regularly pass by the restaurant, stopping in front of the restaurant that hosts many clients. Customers like to eat hummus and Israeli dishes. But if P. or Y. will realize their threats, it will probably not be enough.